I was so disappointed when I realized I wouldn’t be able to make it to the graduation party for my good friend’s daughter Madison this past weekend, so I wanted to show her some love on my blog. While I rarely share any of my non-newborn work, the truth is, not all my client’s babies are brand new. In this case, I photographed Cale and Stefanie’s youngest daughter Stella, less than a year ago (if you missed it, you can check out that blog post here), so when Stefanie asked me to photograph her oldest “baby” for her graduation, I couldn’t say no. One of the advantages of working with friends is you can normally talk them into things you want to do, but you aren’t entirely sure will work out. I’ve been wanting to do a photo shoot at a fair for a long time, but was worried about working around the crowds. 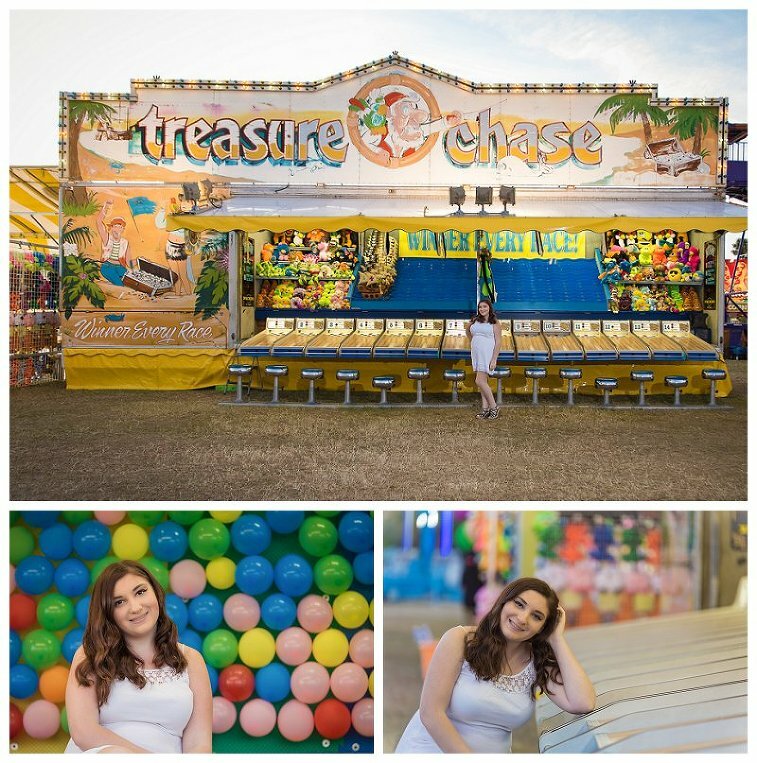 So I convinced Maddie to let me do a 2 part session, day 1 being at the fair in Titusville, and day 2 going to downtown Melbourne like we’d originally planned. We had so much fun! I’m so glad she was down for it! We got there early so I could scope things out and we could get at least a few shots in case the crowds did become an issue. That worked to our advantage because we had extra time for cheese fries, cotton candy and fried oreos. Yum! I loved working with all the different colors and patterns the fair offers. Plus little things, like the dragons were fun enhancements to her senior album. Day #2 started with a quick stop at this super fun shark mural in downtown Eau Gallie. And then we headed to downtown Melbourne for the remainder of the session. Melbourne reminds me of downtown Cocoa Village in that you can wander around and find so many different architectural elements, colors and textures in a relatively small area and never have 2 sessions turn out exactly the same. Madison wanted to wear one of her prom dresses for part of her session, which I absolutely loved. On top of being beautiful, Maddie is also sweet, talented and incredibly smart. She just graduated with honors at her high school AND earned her AA from Eastern Florida State College! If that wasn’t enough, she is also a talented singer and such a sweetheart. I have absolutely loved getting to know her and watch her grow into such an amazing young woman.